The Kumajaba pass is quite a climb, ascending 562m over 9 km producing a stiff average gradient of 1:16 with some sections being as steep as 1:9. It's named after the mountain and village of the same name, which are both traversed by this pass. This is a typical B-grade gravel road found in the Eastern Cape and drivers can expect corrugations, ruts and washaways. During the summer season mountain mists are a regular occurence, when visibility can be reduced to just a few metres. 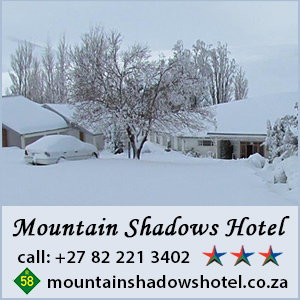 With a summit height of 1509m snow falls occur during the winter season. Apply common sense and be practical about what your vehicle is capable of. In addition to the above, always expect livestock on these roads, as well as slow moving vehicles, children and pedestrians. The mountains below and above the pass are dotted with widely spread tribal villages, so keep your speed down and stay sharp. It is unclear how the Kwaaimans Pass acquired its name, which translates from Afrikaans as “Angry Man”. There is an area called Kwaaiman in South Africa, but this is located far from the pass, south-east of Umtata near Coffee Bay. The pass is situated on an unnumbered gravel road which runs on a north-south axis linking Cala in the north with the R61 near Tsomo in the south. The road is in a reasonable condition and shouldn’t present too many issues in dry weather, but a high clearance or 4x4 vehicle is recommended. Hazards include all of the usual rural Transkei problems, primarily free-roaming livestock. This is considered to be a high-crime area, and it would be advisable to tackle this route with at least two vehicles. This relatively unknown tarred pass forms part of four passes along the R410 route between Queenstown and Elliot in the the high altitude region of the Eastern Cape - the others being from west to east the Nonesi's Nek Pass, the MacKay's Nek Pass, this pass and finally the Cala Pass forming a set of huge stepping stones towards the highest region of the Eastern Cape and the gateway to all the major gravel passes close to the southern Drakensberg and Lesotho. The pass offers lovely mountainous scenery and a traverse alongside a river filled with white water during summer. It's modern, well engineered and is suitable for all traffic. It's 12,3 km long and has an altitude variance of 323 vertical metres to summit at 1566m ASL producing an average gradient of 1:38 with the steepest section being at 1:11 The pass is subject to winter snowfalls. This is the newest major tarred pass in South Africa with a 2008 construction date. The pass descends an impressive 751m down the escarpment through the Langeni Forest. It has an average gradient of 1:22 but most of the southern portion is fairly steep at 1:10. Modern engineering is evident throughout this pass, of which probably the most impressive feature is the 235m long viaduct over a section of the indigenous forest, which is built at the same gradient as the road - steep! The road connects Ugie in the north with Mthatha in the south-east.